Searching for fossils in the desert is hard, hot work. After a long morning of mapping and surveying in Hadar, Ethiopia, anthropologists Donald Johanson and Tom Gray took a shortcut back to their Land Rover. As they walked through a gully, something caught Johanson’s eye: a forearm bone. They walked over to it and soon spotted a thighbone and a skull bone. Ribs, a pelvis and a lower jaw followed, making that hot dusty morning one they wouldn’t forget. That evening – November 24, 1974 – Johanson and Gray celebrated their discovery with their colleagues, drinking, dancing and singing to The Beatles’ “Lucy in the Sky With Diamonds.” Nobody quite remembers who, but someone that evening named their discovery “Lucy,” and she soon became the most well-known early human fossil ever found. Forty years later, researchers discovered a non-human bone in the skeleton. 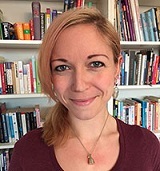 Dr. Marc Meyer of the Department of Anthropology at Chaffey College and colleagues from New York University and the American Museum of Natural History have published an article in the Journal of Human Evolution revealing that one of Lucy’s famous bones in fact belonged to a monkey. By showing that the rest of Lucy's skeleton was correctly attributed, Dr. Meyer says the new findings strengthen the case for evolution. Lucy is the common name for fossil AL 288-1: hundreds of pieces of bone that make up around 40 percent of the skeleton of a female Australopithecus afarensis, an early human ancestor, which was estimated to have lived 3.2 million years ago. In fossils this age, it’s unusual to find so many bones intact. This is particularly true of vertebrae, which are very rare in the fossil record because they are soft so do not often survive. A trained anatomist, Dr. Meyer has been working specifically on vertebrae for 15 years, making him one of relatively few specialists. Vertebrae are typically assigned general levels, like the “upper thoracic,” rather than being put in their exact order, as they are so similar to one another. However, Dr. Meyer and his colleagues wanted to figure out which specific levels Lucy’s vertebrae belong to, when one of their collaborators – Mike Smith, Associate in the Division of Anthropology at the American Museum of Natural History – suggested that one of the bones may be too small to belong to the skeleton. And question they did: after close examination, Dr. Meyer and his colleagues found that although the majority of bones in Lucy’s vertebral column did indeed belong to her, one of them came from a different species entirely. The rogue bone was from an extinct relative of the baboon called Theropithecus darti, the most common monkey around when Lucy was alive. 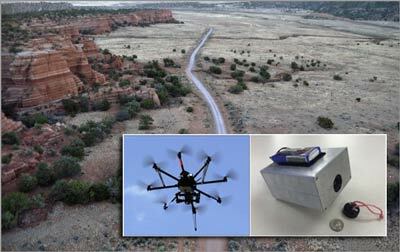 New technology, old-fashioned detective work. Perhaps this shouldn’t be surprising considering that in their original paper examining Lucy’s skeleton, Johanson and his colleagues noted that one of the vertebrae looked different from the other bones; it had a different texture to it. Since then, studies have been carried out on high-quality, detailed casts to protect the original. But since even high-quality casts don’t capture properties like texture very well, this difference was overlooked for decades. When they started to look at the difference in size, Dr. Meyer’s colleague Dr. Scott Williams, Assistant Professor in the Department of Anthropology at New York University, flew to Ethiopia to examine the original skeleton, which is stored in the Paleoanthropology Laboratories of the National Museum of Ethiopia in Addis Ababa. We looked at every species that was potentially there – porcupines, small cats and baboons – to see if we could match the bone to the vertebrae of another animal. Eventually we found it was the right size and shape for the baboon, which further analyses supported. 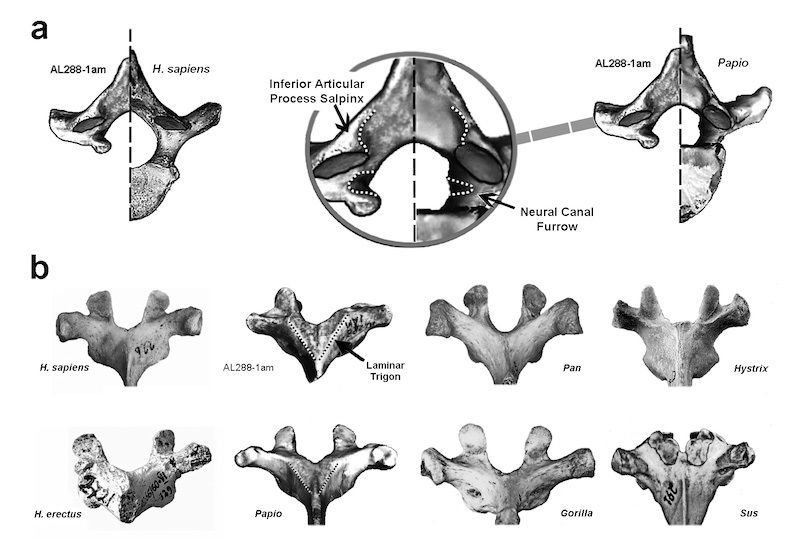 Dr. Meyer and the team used some methodologies that weren’t around when Johanson and his team first examined Lucy: methods like landmarking and geometric morphological analyses, which are used to map the 3D shape of the bones, are not new to science but had not been widely used to analyze fossil vertebrae. 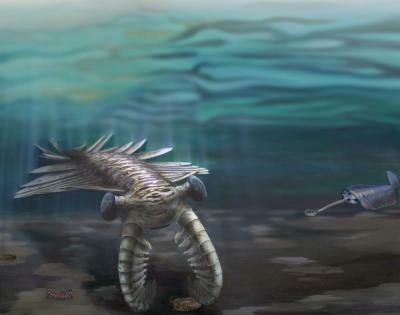 And new discoveries of fossil vertebrae provide a bigger basis for comparison. 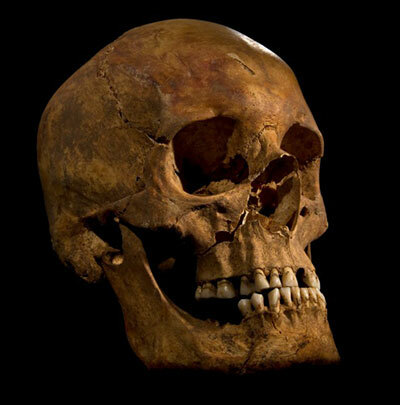 How did a rogue bone go unnoticed for 40 years, in such a publicly visible and important skeleton? According to Dr. Meyer, it may have been a matter of volume. 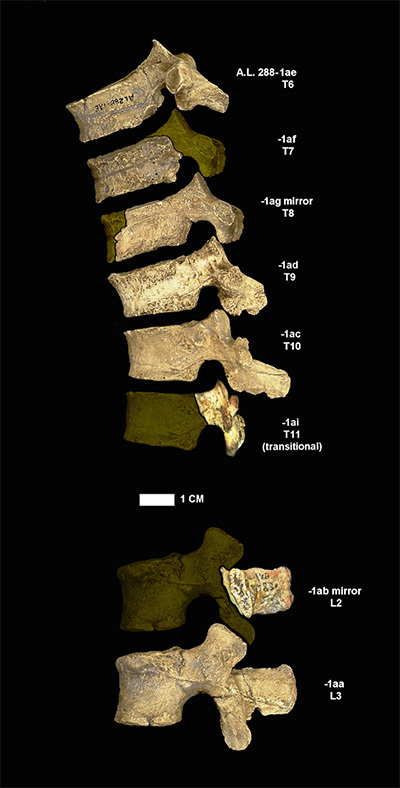 Exactly how the baboon vertebra ended up mixed in with the other, correctly attributed bones of Lucy’s skeleton is not so clear, but the researchers have a few ideas. The bone has a water-washed look to it, leading Dr. Meyer and his colleagues to suspect it was washed in from somewhere else on the flood plain. It may also have been eaten by a carnivore like a hyena and excreted near the skeleton (although that’s a stretch, according to Dr. Meyer), or deposited years earlier or later in the soil above or below Lucy. Discovering the anomaly doesn’t undo the groundbreaking work of Johanson and others, says Dr. Meyer. “In Ethiopian, the name for Lucy is Dinkinesh, which means ‘you are wonderful.’ Our discovery does not change that. 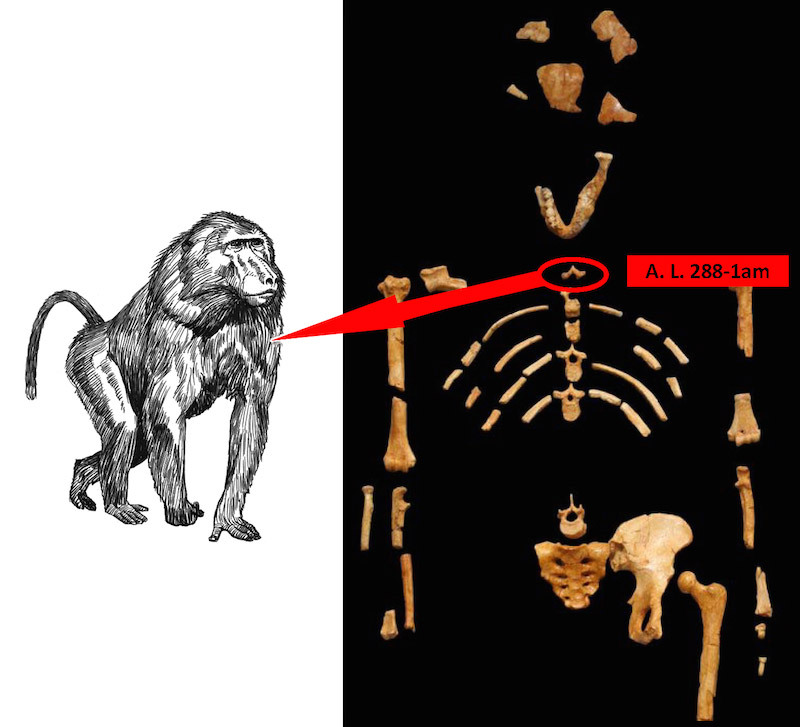 Lucy clearly walked on two legs – as her anatomy testifies, she is a bipedal ape. This one particular vertebra does not change the overall story. Watch the authors' AudioSlide presentation about the new research. 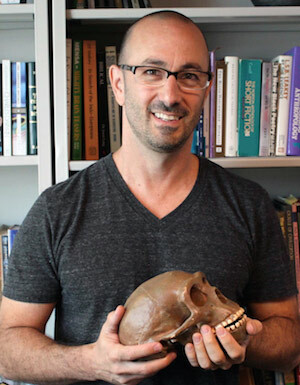 Dr. Meyer and his colleagues hit the headlines with their story after presenting the findings at the Paleoanthropology Society’s 2015 meeting in San Francisco. Dr. Meyer is a human paleontologist and functional anatomist with a focus on the evolution of the vertebral column. He earned his PhD at the University of Pennsylvania in 2005 and subsequently served at UPenn School of Medicine as Instructor of Human Anatomy. His paleontological research focuses on the axial skeleton, postcranial neurology, and positional and locomotor behaviors of australopithecines and early genus Homo. He is currently collaborating on analyses of fossils including Ardipithecus ramidus, Australopithecus afarensis, Australopithecus sediba, and on hominin fossils from Rising Star Cave in South Africa. He currently teaches biological anthropology at Chaffey College in California.